Tibby Bloom (Dinah Manoff) is a professional wife. When her husband dies she discovers that her wealthy, privileged life was a sham and she is left homeless, fundless, and skill-free. 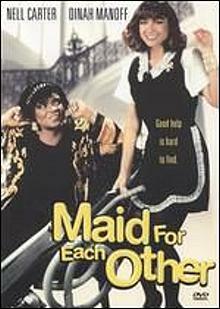 She finds employment as the maid of singer Jasmine Jones (Nell Carter), who is making a comeback. Too bad Jasmine has a dead husband in the closet. This made for television movie is the classic female buddy movie. Two women with different life experiences who are embroiled in a crime and must solve it to keep themselves free. Fast-paced, well-characterized and good fun, this film challenges nothing but is an undemanding good time.